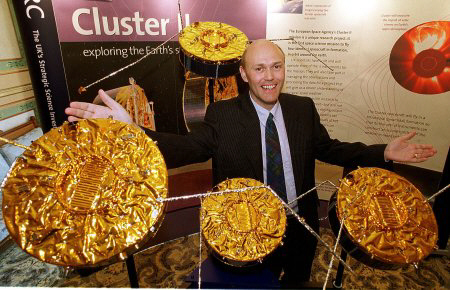 Early in 2000 the European Space Agency held a public competition "Name the Cluster Quartet". The overall winner, chosen from 5,000 entrants across 15 countries, was Mr Ray Cotton from Bristol who named the spacecraft Salsa, Samba, Tango, Rumba. Ray and his wife Christine are keen amateur Latin American and ballroom dancers and thought that these names were in keeping with the way in which the craft has to stay in formation and manoeuvre themselves whilst orbiting the earth. As part of his prize Mr Cotton and his family (Christine, Andrew and Matthew) visited the operations centre in Germany (ESOC, Darmstadt) to watch the launch live and the headquarters of the ESA in Paris. Today's presentation of the Cluster model to the home city of the winner, Bristol, is the final part of the prize. This is somewhat significant as components of the spacecraft (major subsystems including altitude and reaction control, and launch support) were built at Filton in Bristol by Astrium (formerly Matra-Marconi Space UK) prior to the company moving to Stevenage in 1999. The Model that will be presented is a limited edition 1:10 scale model of the Cluster quartet. After the presentation the model will be on display to the public at a location in Bristol (venue yet to be decided). "We are extremely proud of being part of this unique, groundbreaking project. It was and still is, a European and International venture actively involving input from the public. The Cluster Project promises to open new avenues in space and plasma research which, in the immediate and not so immediate future will allow scientists to discover in greater detail the effects of the Sun on the Earth and our technology. As for ourselves, we are honoured to have named these special satellites and are pleased to promote this little known area of the "Sun- Earth connection" to the European and British public. It is a fantastic commemoration of Bristol's connection with this project. Not only of our naming of these satellites, but also the amazing efforts of the technicians and manufacturers based in this area who assisted in this path-finding mission. Finally, we wish continuing success and many thanks to the European Space Agency and the Cluster team."